IELTS listening map labelling is common in Section Two of the test, though you may get a map in any of the sections. In section two of the IELTS listening test you hear one person speaking. It is quite common for the map to be related to some kind of tour. The aim in labelling a map is to connect the information that you hear in the listening to the gaps in the map. In some maps you are given a list of words and you have to choose the correct word to fit in the map. Other times, you will just be given some gaps and you need to listen and choose the right word from the listening. This lesson is an example of the second type - no list of words are given so you have to identify them yourself. First, take a look at the map, and then read the IELTS listening map labelling tips. Read the instructions carefully - this is so you know what you need to do and the maximum number of words and / or numbers you can use – in this case it is no more than two words. Know the vocabulary of location - you need to know words commonly used to describe where things are located (see below). Identify where the numbers start and finish – as you can see from the example, the first one (15) starts at the bottom, not the top. The numbers (15, 16, 17) will follow the order of the listening. Understand the context - listen carefully at the beginning as the speaker will give you the context. (where you are for example) which will help you follow the talk. Also, look over the map. This will help you identify exactly what you are labelling - note the things that are already labelled to get a feel for where things are. Predict the answers - as with all the listening test, it helps to predict what the answer may be. Look at the gaps and see if you can guess what you are labelling - a room, building, sports facility, street etc? Pay attention to any other clues in the map - for example, you are given a compass icon in the corner telling you where ‘North’, ‘South’, ‘East’ and ‘West’ are. This means it is likely that these phrases will be used to direct you. So listen out for them. You are also given your location - in the tower. 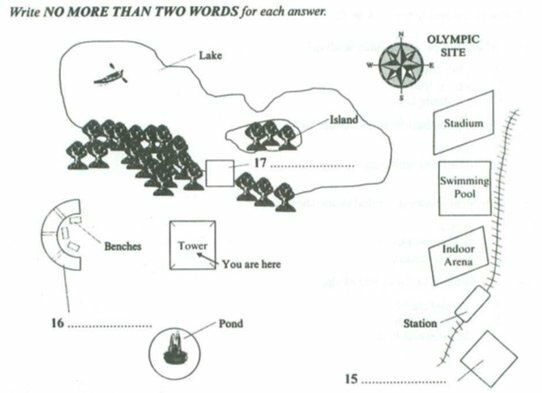 Look at two questions at once - this is something you should always do in the listening test. If you hear the answer to question 16, you will know you missed 15. Forget about this and move on. If you are only looking at 15 you could miss both and get lost. There can be various phrases to explain where things are, but below are listed some of the most common you'll need for IELTS listening map labelling or diagram labelling. Make sure you understand them all. Now take a look at the map again below. Play the audio and answer the questions. Click below to see the answers, the script and some further tips for IELTS listening map labelling. Below is the script for the IELTS listening map labelling audio. The answers are underlined in bold. Also note the language of location which is highlighted in red. The features that are given close to the feature you have to identify are in blue. Remember that they help you to know when your feature is about to be mentioned. Well, here we are at the top of the tower, and we're going to look at the view from each direction. Out to the east, the large buildings about a kilometer away are on the Olympic site. There's an indoor arena for gymnastics, a stadium for track and field and a swimming pool for races and synchronised swimming and also diving. If you look carefully down there, you can see the train lines. The Olympic site has its own station to encourage the use of public transport. There is also a car park, but it only holds a limited number of cars. And around to the west, you can relax and sit on a bench to smell the flowers in the rose garden, and finally up to the north, if you look in front of you now, there's a lake with a small island in the centre. You can hire rowing boats at the boat shed, which you can't see from here, but if you look through the trees, you can see the cafe, which has lovely views across the water. OK, let's climb down now. We will go now and have a look at the nature reserve section of the park, which has opened up natural wetland to the public.